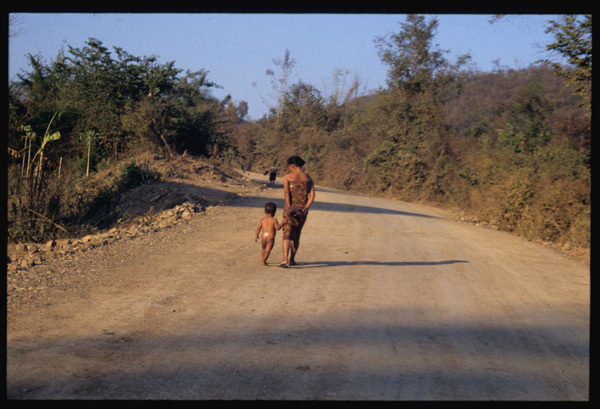 Our first trip to Laos, in 1994, was our virgin foray into Southeast Asia. We were living in Hong Kong, and had lived in and travelled around China, but everything south was, to us, The Unknown. We had three weeks around Christmas. Someone told me Laos was 'incredible' - or maybe I read it somewhere - and so we booked tickets and took the plunge. Landing in Vientiene was a jolt. The city (if you could even call it a city, then), with its single traffic light, seemed as far from Hong Kong as the moon. With their ready smiles and soft voices, Laos were to 'Hongkies' as day is to night. And the food!Lounging riverside, eating sticky rice with spicy dips and laap, garlicky grilled sausages and soups fragrant with intriguingly unfamiliar leaves and herbs, it was hard to believe we were merely two hours from delicate dim sum. On that trip we encountered flavors that simultaneously delighted and confused, dishes that mixed Asian ingredients with those we associated with the West. In Luang Prabang we were served a French-influenced uncooked salad of watercress and runny-yolked boiled eggs dressed with a light gado-gadoish peanut dressing. On the surface of an otherwise Thai tom kha gai-like stew of chicken, galangal, and coconut milk floated a surprising flurry of chopped fresh dill. Zest and slivered leaves of kaffir lime lent a pleasing astringency to egg-based tarts. Bitterness is a flavor we'll always associate with Laos - not the bright, sharp bitterness of a raddichio salad or the caustic, mouth-drying bitternes of arugula (rocket) gone to seed, but the mellow, appetite-rousing bitterness of meaty soups and stews thick with herbs and wild greens. It's a taste and a perfume so common to the country's cuisine that it's hard to imagine a Lao meal without it. I was reminded of that distinctive bitterness the other day when I came across boxes of long-dormant slides from that and subsequent visits to Laos. Dave's images triggered a rush of memories - of a dusty bicycle ride to a crumbling, abandoned wat in a forest outside Luang Prabang, of a gulp of lao lao and wrists tied with bracelets of white string before a bumpy (and - because our drivers had partaken too - slightly frightening) jeep journey across the Bolaven plateau, of a slow boat from Pakse to a speck of a village and the deserted ruins at its edge. Suddenly I was craving the comfort of a pungent Lao stew accompanied by sticky rice. That night I prepared the following recipe. The kitchen smelled, to us, like the probably long-gone Luang Prabang hole-in-the-wall where we fell in love with Lao bitter. Adapted from Alford and Duguid's Hot Sour Salty Sweet (page 245), a seven-year-old book that continues to surprise us and feed us well (every single recipe works, brilliantly). I've changed the quantity of some ingredients, increased the cooking time, and substituted pork ribs for the sliced pork in the original recipe. The bones add tremendous flavor and, after long cooking, slide right away from the meat. If you're averse to bones in your stew then remove the ribs and let them cool, take the meat off the bones, and return it to the pot before serving. This comforting stew is incredibly easy to make - minimal active time and long cooking. The combination of dill, mustard greens, and lime leaves makes for a complex earthiness marked by gentle bitterness. Sticky rice is the best go-with (very easy to make - just remember to soak the rice overnight), but regular white rice will do. Heat things up a bit with a side of Thai nam prik dtaa daeng, replacing the smoked fish with a teaspoon or two of fish sauce (to taste) and fresh minced galangal, or with a Hmong scallion-chile relish from Andrea Nguyen's article on California Hmong farmers in the August-September 2007 issue of Saveur. 1. Heat the oil in a medium heavy pot over high heat. Add the garlic and shallots and stiry-fry briefly, until they start to brown. 2. Pat the pork ribs dry with a paper towel and add to the pan. Stir-fry to brown the ribs all over. Add 4 cups of the water and then add the dill, choy sum, and chives. Tear 5 of the lime leaves into pieces and add to the pot as well. Stir to immerse the greens. Water should nearly cover the ingredients - if necessary add more. 3. Bring to a boil and then reduce heat to a gentle simmer, stirring to immerse the greens. Partially cover the pot and cook slowly for about an hour and a half, stirring occasionally to make sure all the greens are cooked. Add more water if anything starts sticking. 4. At the end of cooking time the greens should have softened and partially melted into the stew and the meat should be falling-apart tender. Add the fish sauce and taste for seasoning. At this point the stew can be set aside for a couple of hours or refrigerated overnight. 5. Just before serving, bring the stew back to a simmer. Stack the remaining three lime leaves, roll into a tight cylinder, and slice into slivers; add them to the stew, along with the scallions and lots of black pepper to taste. Serve in bowls with rice on the side. How different is Laos now compared to your 1994 impression? Do you have any updates? Bayi - we haven't been back since 1996! (But I think that will soon be remedied, once Air Asia starts flying to Vientiene route next month). I suspect it's changed a lot, I know Luang Prabang certainly has now that it's on every travel magazine's 'hot' list. But from what I hear the relatively slow pace and friendly people (and great food) that we encountered 10+ years ago haven't. We are really looking forward to returning at some point. It'll be right up your alley. I loved it. Sticky - have had it on my shelf for a while, saving it for a vacation read. But we're not doing too much true vacation-ing lately ... so perhaps I'll pull it down and dig in. Thanks. Laos has changed greatly since the mid 90's! After the Friendship Bridge opened allowing an easy flow of both tourists and Thai/Laos people to readily mingle plus many Vietnamese who landed in this country much has changed. The once remembered sleepy town on the river is now a dusty busy industrial feel city. Luang Prabang has been going through a transformation and rekindling of the French era with numerous old French Colonial building gleaming with refurbishment and new paint. Nonetheless this town still captures your heart with it's charm and hints of life of a previous century. Even the tourist clogged night market has charm and if you are savy of Vietnamese and Chinese goods being touted as local handicrafts you can ferret out some truly amazing local handicrafts. Luang Prabang is one of my favourite places to visit in the world-an unfortunately the same for many others. Now the charm must be shared with far too many gawkers-mainly backpackers looking for a party. We're heading there as well as Siem Reap with our children and grandchildren this Dec. It will have been 20 years since our son has traveled these parts with us when he was 18. A fun time for him to expose his chicldren to amazing places. We were just in Cambodia and Thailand in Dec 2007 and can sadly see the constant changes everywhere. I miss the quiet little towns of Chiang Mai and Chiang Rai of 20 years past, and the lovely trekks to Hill Tribes in remote areas. Those treasured times can only be memories now. Mary-Anne, if you're still out there am curious to know how your son found Luang Prabang. hello! I love your blog so much. Are the "lime leaves" in your recipe is the same thing as kifferlime leaves? Lalita -- yes, exactly. "Kaffir" is a sort of nasty Thai term for Indians, so these days writers are just calling them lime leaves or wild lime leaves.